The Brothers Tick the Second Month on the One-Per-Month Quest. 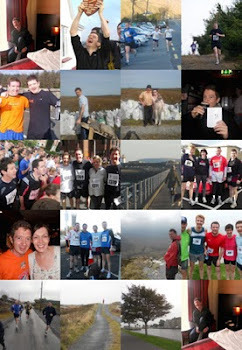 Two from Twelve as the Brothers O'Hara completed the Birr 10k to mark the February calendar. We lost one brother, Cormac - he was reporting for RnaG on the little matter of a general election, but we gained another in Richie, who tore up the by-roads and side-roads around Birr to finish in 47 minutes. And believe me that was an achievement for this was one hell of a tough run! Kevin turned out for this race as a far fitter specimen of man than that which competed a month ago in Tuam, and so-signs on it as he trotted home comfortably in 54 minutes. There is a fit train a-coming from the direction of Mullingar... Personally, I found the going extrememly tough, finishing in the 50 minute mark and I reckon my weeks of stop-start training and over reliance on the treadmill have sent me on a downward spiral that needs to be checked. There is no substitute for the open air. The race itself was extremely well organised and it was a big bonus to have gotten such a nice day in one of Ireland's finest little towns. We started in the centre of the town, at John's Mall, and headed out the Kinnity road for about 4k, before turning right for 1.5k and heading back in again towards town - with the finish line alsoat John's Mall. I think it's fair to say that there was no down hill and very little flat parts of this race! It seemed to drag from slight incline to slight incline and every time we came to the brow of a hill our expectations of a downhill were dashed by another flat or worse still, another bloody incline! Having said all that, it was a very good run and very well marshalled. The organisers have told me to expect another run in Birr town in 8 weeks time - this time possibly around the grounds of Birr Castle, and yet another around Kinnitty Castle. Hopefully we'll be back... As for the O'Hara brothers: we celebrated our run with a good few pints in the County Arms Hotel and were joined by the election count man the following day. Onwards to March, when I personally will compete for a PB in the Craughwell 10mile, and when we will also have to find another race on the one-per-month brotherly quest for fitness. Another four miles at a fair pace this evening. Treadmill. Big race coming up on Saturday in Birr for the O'Hara brothers, who can now confirm that young Richie will be present...Methinks a Thursday trot will leave me in a good state. I took the last week off from running, due to the onset of a winter cold. This morning, up in my wife's Wee County, I resolved to get out and at it again. My route was the usual Louth route - the little road to the back of Stabannon Church, then heading right, past the old graveyard and straight on for two miles as far as the old castle. All in all I probably ran about five miles, or just shy of that. It's strange how a short week away from running can set you back so much as I was struggling at times and even felt like turning back a good deal earlier. Next Saturday I'll be in Birr for a 10k run with brothers Kevin and possibly Richie, which will mark the second of the O'Hara's 'Run Per Month Schedule'. Unfortunately we will not have Cormac on board this time around and it's also looking dodgy for Richie (Cormac will be otherwise engaged as election reporter and it's likely that Richie's soccer commitments may see him having to miss the race). Still, as long as we have two brothers per month it's still a valid cause! My starting point: the Coral Strand. At last I shook free from the treadmill and went out into the fresh air for a run that was about 5 miles in distance, and somewhere in the region of 8.30 in pace. The first part of the day was borrowed from high summer, while the second part was a borrowed from, well a typical Irish rainy winter. So glad was I that I availed of the fine weather. I started my run down by the coral strand - Trá an Dóilín, and ran across the eastern side of the beach and a trail that I had heard about from Rónán, but hadn't run before. I had no choice but to run this section at pace, as I was leaping over seaweed and slippy rock. The trail led me to a little pier which I had never seen before - our peninsula has a pier at the end of every little road. From that point I followed an uphill section of road that ran for about a half a mile until I reached the main route to the beach again. I turned left instead of right at the top of the road and headed toward the village but broke off to take in another road, that led to another pier at Caladh Thadhg...I felt good enough today, and was full of beans at this stage. There is about a mile (not fully) in the road that leads to Caladh Thadhg and back. Down at this pier there were about fifteen boats of all shapes and sizes anchored up, and about fifty lobster pots stacked ready for the next day. The way back from that pier to the top of the road calls for a big climb - so the elbows were grinding like the axle of a steam engine as I tried to motor on up! I ran on into the village then and really could have gone on for a good while, the day being so fine, but for two reasons: today is wifey's birthday and I was anxious to be back at a decent time and, Ireland were due to play France in a big rugby match (which we lost, but only just!). All in all, I enjoyed today - it's great to get back out. 3 Treadmillian Miles Considering this Whacko Election. Imagine an election where one of the main parties can't muster enough souls brave enough to canvass door to door, where the Taoiseach (PM) elect isn't brave enough to participate in a leader's debate and where the electorate is mad as hell, but not brave enough (or bothered enough) to do any of that Egyptian-style protest. Yep, it's the Irish election. Factor into this the fact that we are merely electing a Government to implement an IMF-EU four year austerity plan and you can see why we are less than tickled pink by this chance to express our democratic right to vote. But despite all this economic Armageddon I've noticed that the hills are still green, the sea is still blue (well, grey-green), the fields are full of grass and heather and the roads are made for running. So why the hell am I still in a treadmill phase? How to Combat Treadmill Misery. I dreamt I was back walking up the bright trail to the top of Slieve Foy. A Louth Sheep, relieving himself on the side of the mountain. Situated in the old viking town of Carlingford, it is just big enough to walk to the top and back in three hours. And walking the Foy has a magical way of making a pint of stout taste 100% better (at least, I've heard this - last year I was on a restricted diet of Guinness so I didn't partake of a bevvy after my walk, but I'll put it to right this year). What I'd also like to do this year is to run up the Foy, or at least a good part of it. After all, I'm sure a torturous run up a mountain still beats the hell out of the treadmill.